Easter is middling early this year, with Easter Day falling on April 1st. That means that Lent starts middling early as well: Ash Wednesday is 14th February. 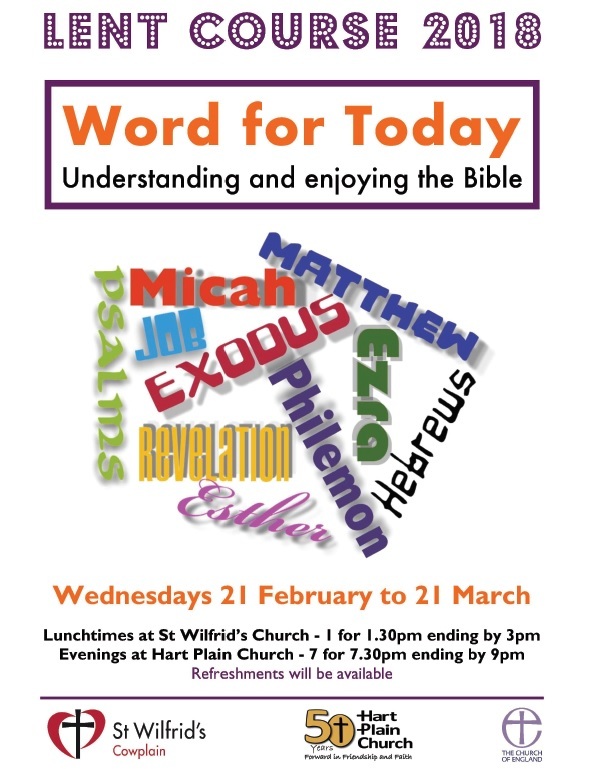 And just a week after that, our Lent course begins, lasting for five Wednesdays altogether. What’s it about this year? In a word, it’s the Bible. Not that you can say or think about everything to do with the Bible in just five sessions. That’s part of the point, of course: for many Christians, the Bible is long, complicated, sometimes unintelligible, often confusing, even intimidating, you name it… and the coming Lent course is about how to start to make sense of this book of books which is at the heart of Christian believing and behaving. More than that, the course is about how to begin to enjoy the Bible. I have written the course, which has the same title as this piece. Early in the autumn, Ian asked me to write it for use, say, after Alpha or perhaps in house groups or – ‘well, let’s see what it looks like when you’ve done it’. The upshot is that it seems best used as material for the now annual course, with the afternoon and evening sessions shared in by St Wilfrid’s and Hart Plain churches. 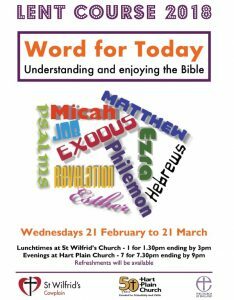 The five sessions are: 21st Feb: Basic Bible; 28th Feb: Four helpings of Good News; 7th March: Textbook for living: or is it? 14th March: Wrestling with God: the Old Testament; 21st March: Found in translation: the English Bible. The content of the course is not devotional, nor sermonic, and certainly not heavily academic. On the other hand, it is intended to make participants think a bit. All the sessions, to be led by Bruce, with worship conducted by leaders from our churches, will include some teaching ‘from the front’ but also – and very importantly – material for discussion in groups. No one will be asked necessarily to agree with my own opinions, stated or implied in the text: but participants will have the opportunity to ponder Bible passages and share their own opinions with others. For really keen people, there will be some optional items to think about at home. During my years as a journalist in the Christian press, I wrote several articles about the decline of Bible reading among Christians, as traced by the Bible Society and other agencies. It’s well beyond time to start to push the figures in a positive direction. The most important reason for this is that the Bible, to use a familiar phrase, is ‘a means of grace’ – which means, that as we read with faith, the Lord Jesus comes from the pages to share himself with the reader. This is what enjoying the Bible really means: may it be the experience of us all!